In a chemical aircon wash, it is a thorough washing of an air-conditioner as compared to general aircon servicing. It’s not an easy process as it requires expertise and experience in washing the unit properly with the use of chemicals. An air-conditioning chemical wash is normally necessary for units that are often lack of regular maintenance or is full of dirt, debris, grime or older units where it will clean your units thoroughly and regain the cooling functionality of your unit. A chemical wash is one of the most effective cleaning service and have many benefits such as improving cooling efficiency, cleaner air, stronger air flow, reduce possibility of break down and extend life-span of your air-conditioning equipment system. It is a higher grade of aircon cleaning as compared to other aircon services such as general aircon servicing. You may wonder why you should opt for a chemical aircon wash in Singapore. The answer is simple, because it have many benefits to your air-conditioning system! A chemical air-conditioner wash is one of the great aircon services that could help to improve the condition of your unit. It is able to wash and flush out all the dirt, dust, debris, grime and other harmful bacteria that have accumulated in the air-conditioning unit. By washing out all the harmful substances, it is helpful in improving the cleanliness of the indoor area which is especially important family members that have illness such as asthma or allergies. By having chemical wash, this will ensure the environment is clean for them to rest and sleep with. If you ever feel that your aircon is smelly, no cold air, water leaking problem, a chemical aircon washing is the most effective aircon service in solving all these aircon problems. Other than that, air-conditioning chemical wash is able to provide cleaner and healthier air, stronger air flow, increase cooling efficiency, increase efficiency, reduce chances of air-conditioner breakdown and extend life-span of your air-conditioner. It will also help to reduce the energy consumption of your air-conditioning system which means lower energy bills. So you may wonder what is the difference between aircon servicing and aircon chemical wash. If you are unsure which aircon service you should opt for, the answer is simple. When general aircon servicing could not improve the condition of your air-conditioner, it’s time for a chemical wash. Aircon service is suitable for regular cleaning and maintenance of your unit which helps to maintain and keep your unit in good working condition. For chemical wash, it is suitable for unit that is dirty or the unit is old and by having a chemical wash, it will flush out all the dirt and improve the cooling efficiency of the air-conditioner and regain the cooling functionality of the unit. A general servicing involves cleaning of the different parts in an air-conditioner without the use of chemical products. This is often carry out in maintenance servicing of the air-conditioning system which is done often such as monthly, bi-monthly or quarterly depending on the usage and condition of your units. This kind of service is essential in keeping your air-conditioner clean and in good working condition. For air-conditioner chemical washing, it is a more detailed and thorough service as compared to general servicing. If your air-conditioner unit is not being serviced for a long time and there are accumulated dirt, dust and grease that can’t be cleaned by general servicing, you may need to opt for a chemical wash. By washing and flushing your air-conditioner with chemicals, it is able to clear and remove all the stubborn dirt, debris that have accumulated in your units. 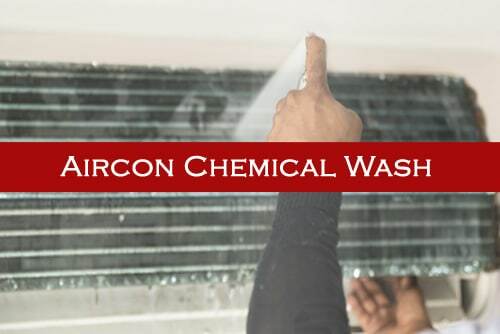 Besides that, if your aircon is smelly due to growth of mold or bacteria, chemical wash can also solve the issue you are facing and reduce the possibility of it growing. If you have no idea which aircon service you should opt for your air-conditioner, you can contact our staff and we will advise you accordingly depending on your aircon needs and condition. We specialise in aircon servicing, chemical wash, maintenance, repair and installation in Singapore. We are able to provide you wide range of aircon services and advise you on the most suitable air-conditioning service for your home or office. We are your one stop quality aircon services in Singapore and we will ensure your air-conditioner is functioning properly and efficiently. Do not hesitate and contact us for quality service now. Chemical wash aircon is one of the most effective and thorough cleaning service among our aircon services. Thus, the price of chemical aircon wash will be higher as compared to our other aircon services. However, with the quality of the chemical wash you are receiving and the benefits that you can enjoy, it is considered an investment for maintaining your aircon units. It is important to hire a professional aircon company in Singapore for chemical washing. A qualified and professional air-conditioner company will have better knowledge and experience in chemical washing your air-conditioner. This reduce the possibility of your air-conditioner being poorly handled by inexperienced staff. Other than that, they will have the right tools, equipment and chemicals in performing the chemical wash. It is important to use the appropriate chemicals to chemically flush and wash your air-conditioner in order to thoroughly flush out all the dirt, debris and grease that have accumulated in the unit. With the wide range of different aircon brands in Singapore, an inexperienced staff may not have chemical washing the type and brand of your units which may lead to issues such as mishandling. This may led to poorly washed air-conditioner or parts being mishandled which may cause additional repair cost. Therefore, when you are finding an air-conditioner contractor to chemical wash your air-conditioner, you should look for experienced, qualified and professional aircon company to perform the job. Our company have the knowledge, experience, tools and equipment to perform quality air-conditioning chemical wash for your home or office air-conditioners. We are confident that we are able to meet your aircon needs and regain the cooling functionality of your air-conditioner by engaging our chemical washing service. If you are looking for quality aircon chemical wash in Singapore, contact us to book an appointment with us today.